Truly bizarre can that likely held beer, as the gold foil pull top still stays on the top lid, but had been peeled back to expose the holes that would seem to be there to make the beer even more carbonated, as they are very small. I didn’t realize that Bud/Anheuser Busch put this into production, but this seems to be the case! First time I’d ever seen it. Why had its inventor given the spout its colander-like pattern of holes? I doubted that their purpose was to “make the beer even more carbonated.” But what were those holes really for? 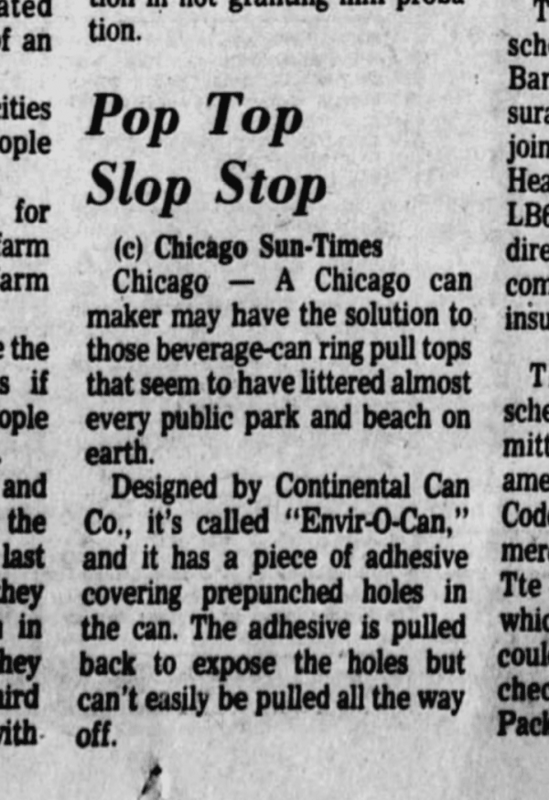 I soon learned that this was Continental Can‘s short-lived “Envir-o-can” closure. 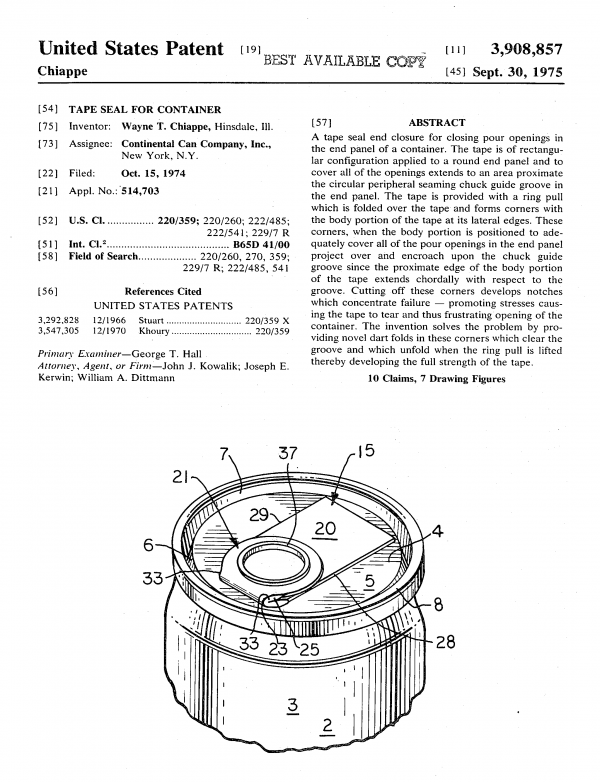 The point of this mid-1970s invention was to solve the problem of discarded ring-tabs. I’m old enough to remember seeing lots of those discarded ring-tabs alongside Florida roads when I was in junior high school. There were also plenty of empty cans, of course, along the same roads. I guess the idea was that keeping the tabs attached to the cans would make picking it all up a bit more feasible. Hence, the environmental brand name. 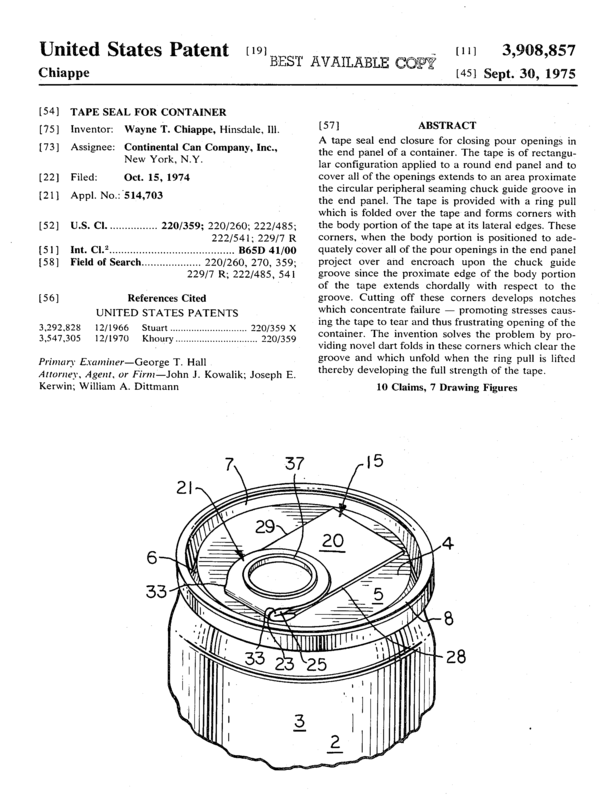 Searching for a pull tab patent assigned to Continental Cans, I eventually found Wayne T. Chiappe’s 1975 patent entitled, TAPE SEAL FOR CONTAINER. So, as suspected, the holes do nothing for carbonation. … Mr. Chiappe joined the Continental Can Company where he was employed for 31 years before resigning as Vice President and Corporate Officer in 1981. He then stared Chapco, Inc., a privately owned company specializing in packaging equipment and packaging systems. 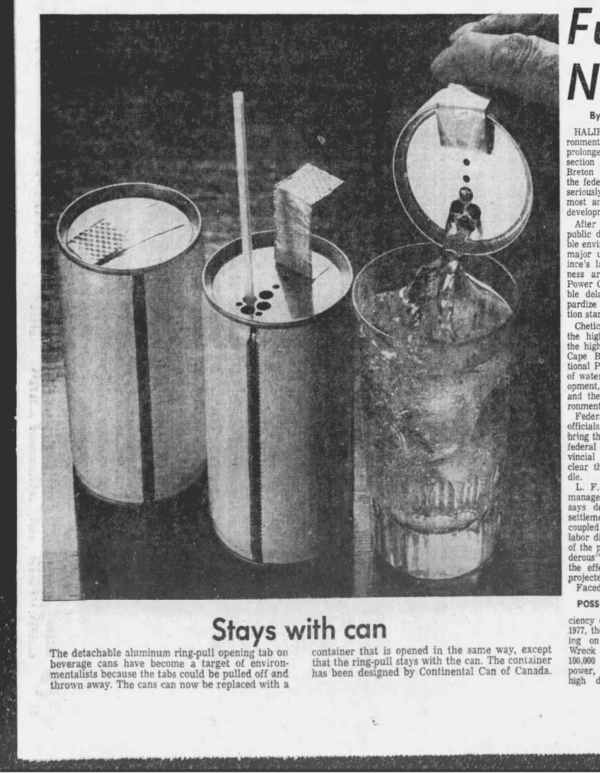 Starting in 1974 we find newspapers publishing stories about Continental Can’s new product launch. Most of the articles were positive, likely based on the company’s press release. Some folks, however, were less enthusiastic. 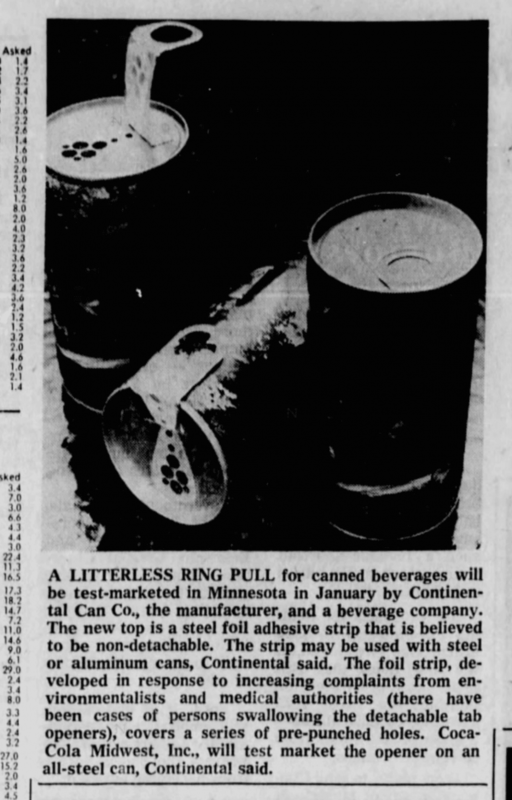 This, of course, was before recycling cans was the norm. 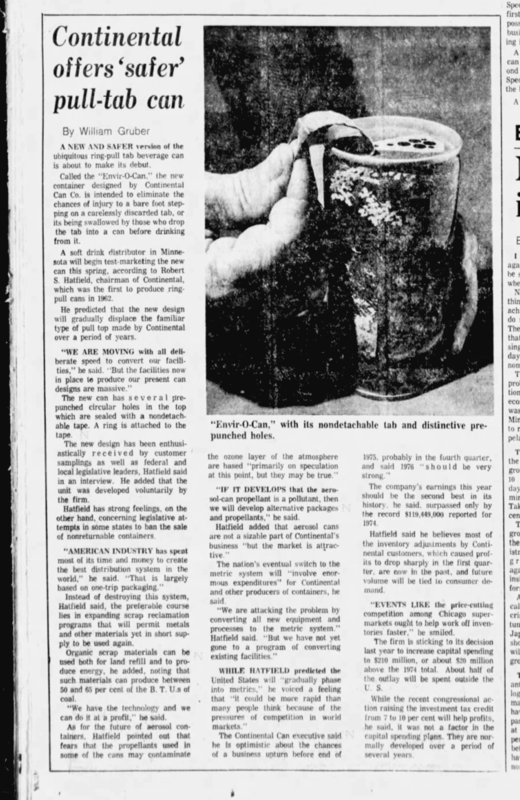 So, whether the pull-tab remained attached or not, it was still a disposable container. Ultimately (like most of us) the Envir-o-Can lost out to its competitors. 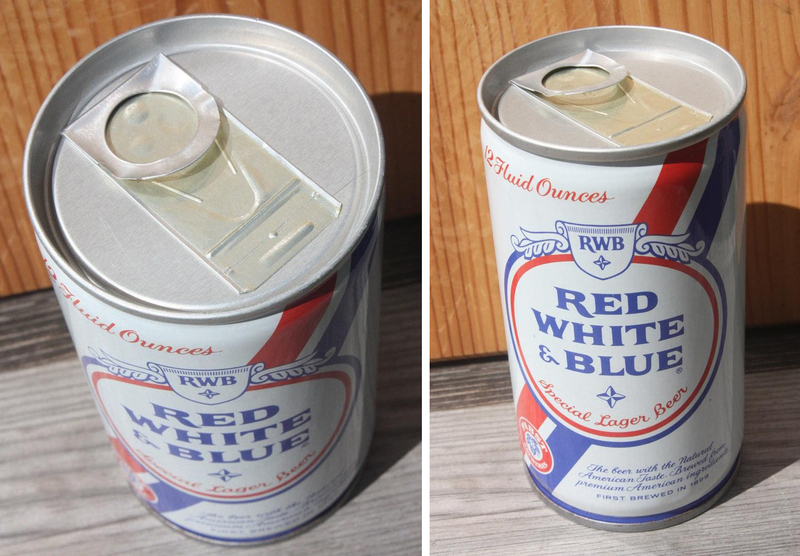 Another beer brand (Pabst) also tested the Envir-o-Can closure. This can was also sold on eBay last year by the same seller as the Budweiser can. See also: Pull-Tabs & Pop Top Rings, and listen to Pop Top Ring, a song (written by Josh Weisberg and me) with lyrics based on a personal 1970s experience with a different type of pop-top-ring proposal. starting in the 80s I think, V8 vegetable juice in the small 6oz cans was sealed with a mylar (aluminized polyester plastic) pull-tab. 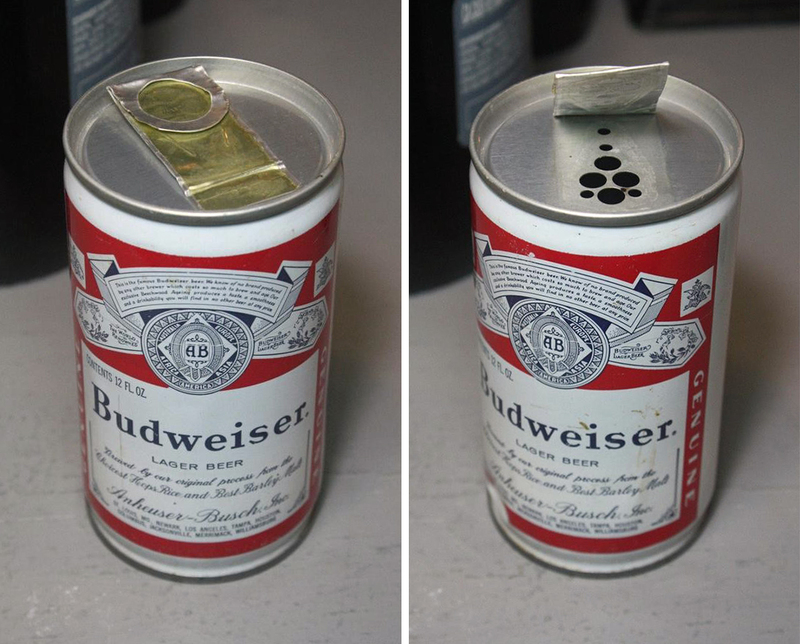 The difference is the cans were packed not under pressure but under vacuum, so the tab was pulled IN to the single teardrop-shaped hole. Breaking the seal would let air in. 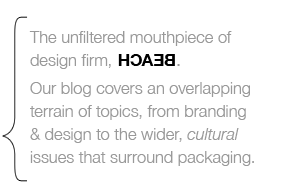 A "Misprint Can" or Deliberate Branding Mashup? A “Misprint Can” or Deliberate Branding Mashup?